If you’ve been invited to participate in the Wordzen Voice trial, you can start using it at 8:00 a.m. CST today! Prior to using it, however, take two steps with... Continue reading "Users who have been invited to the Voice Trial can begin using it at 8:00 a.m. CST today"
An email revolution: You talk. We’ll email. We are currently piloting a revolutionary new feature, which will make sending emails even easier: the ability to record yourself on your iPhone... Continue reading "Big Announcements, including our Voice to Email launch"
We know it’s been a while since we’ve posted, but we think you’ll forgive us because we’ve been working tirelessly on two initiatives that will help with your email efficiency... Continue reading "Announcing a New Product by the Makers of Wordzen"
I am pleased to announce an upgraded version of the Wordzen Chrome Extension, now available from the Chrome Extension Store as Wordzen for Gmail 2.0. 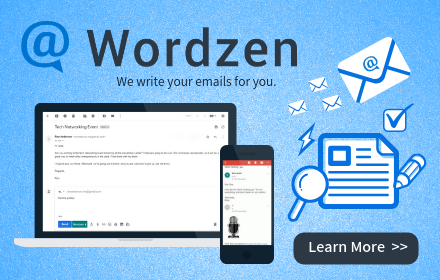 If you already have Wordzen... Continue reading "Announcing the release of Wordzen 2.0 for Chrome"
There has been some confusion amongst our hard-working editors over what constitutes email copy that needs editing versus instructions to them. For example, if your email says: Dear Bill,Tell him... Continue reading "New Bracket Notation for Drafting Emails"